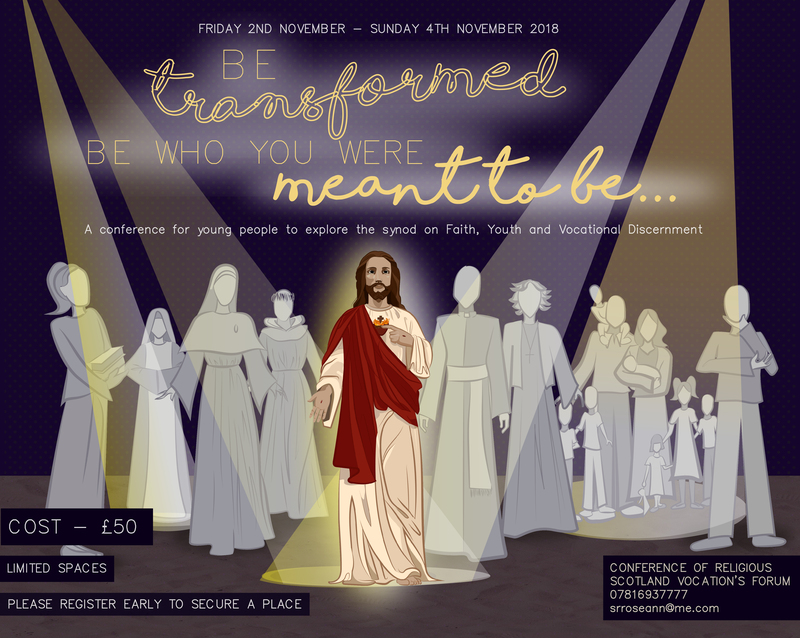 The flyer above is a save the date notice for a young people’s event being organised on 2nd – 4th November 2018 by the Vocation’s Forum of the Conference for Religious in Scotland. The forum has recently been re-established and this event is part of a longer term strategy to make religious life more visible and relevant here in Scotland. A full programme for the event will be available in early August but we wanted to make you aware of the event as early as possible in the hope that you will be able to help us in one of three ways. Firstly, if you have anyone who you think may be interested in the event you can register your interest and reserve a place(s). Secondly, you can sponsor a place(s) for a young person(s) to attend. Cost £50 and cheques should be made payable to the Conference of Religious Scotland and sent to me at the address below. Thirdly, you can help publicise the event through your contacts, parish groups and social media. And, of course we would be most grateful if you could keep this project in your prayers. If you need further information, please feel free to get in touch.